It can be tough trying to find Latin desserts to replicate in our kitchen when many of the ingredients are not readily available to us. Luckily this recipe for Brazilian Guava Soufflé, or Suflê de Goiabada, calls for guava jam, which can be found in most markets these days. Yes, I said Soufflé. Relax, this recipe calls for 3 ingredients and about 20 minutes of your time. Although World Cup has now come to an end, we fell in love with Brazil. Brazil is a country bursting with many tropical fruits, and the guava (Goiabada or Guayaba) is king among them. For this dessert, guava jam or a melted guava paste is used to flavor the delicate soufflé. Making a soufflé is easy, making sure it does not deflate before you are ready to eat it can be a little tricky. Here’s a quick tip: Use cream of tartar in the whipped egg whites to help stabilize your eggs, increasing their heat tolerance and volume. This recipe calls for smaller 4-6 ounce ramekins. This will help with serving individual portions, and if one falls, then you still have five more! This dessert can also be made in a large baking dish to share, but that can be unpleasant with serving and deflating. 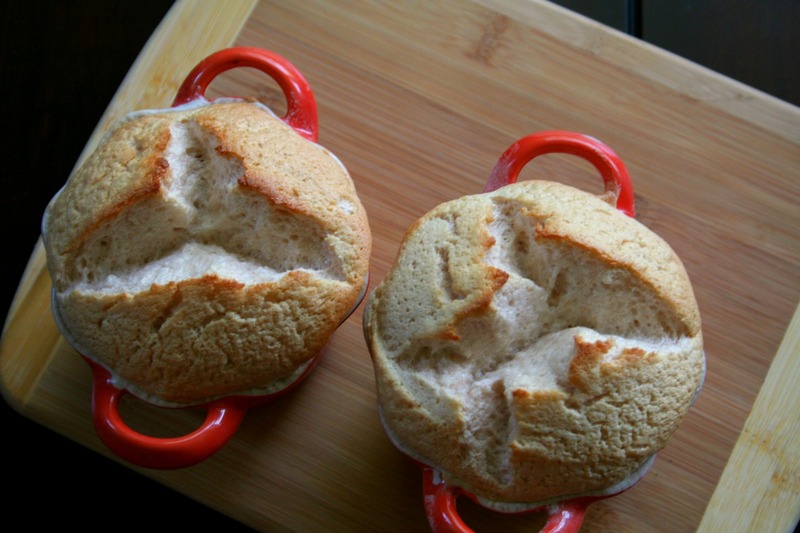 Know this: even the best made soufflé will deflate, and you may only have 5-10 minutes before it falls. Every time you hit or bang the baking dish, you risk a flat dessert. So take your time, and plate with care. An easy way to ease the anxiety of presentation is to quickly hand everyone a spoonful of jam or crème anglaise and have them plunge it into the soufflé. A quick note on step number four: wrapping your uncooked soufflé in strips of greased parchment is meant to help it rise straight up. You can do this with any straight sided dish, but it is not required for a beautiful Suflê de Goiabada, and it will still collapse anyway. Brazilians enjoy guavas and love making their Suflê de Goiabada. The best part is that the elegant and delicate dessert can be put together in minutes and can bake while you are making coffee or serving the port. 1. Preheat your oven to 350°F. In a stand mixer, beat the egg white and the cream of tartar until stiff peaks form. 2. Add the guava jam and beat again until stiff, being careful not to overbeat. 3. Grease and flour 6 ramekins that are between 4-6 ounces. Divide the guava and egg mixture between the ramekins. 4. This step is optional: cut long strips of parchment paper to wrap around the ramekin. You can spray it with cooking spray to insure clean removal. Use painters tape to hold it tightly closed. This can allow your soufflé to rise straight up, but not required for a beautiful dessert. 5. Bake at 350°F for 12-15 minutes, until the tops are puffed up and slightly browned. Serve immediately as is or with a spoonful of guava jam or crème anglaise.